The 1M looks great to me. It's going to make an awesome street and track car right out of the box. Kudos to BMW. More folks like the factory performance vs throwing some aftermarket parts at a less expensive car. Have you ever driven a 335 vs a M3 back to back? If you have, then you'd understand why the 1M is going to be so good. They don't even feel like the same car. After reading over the specs and what they've done differently for the 1M, I think the single most impressive thing about this car is the Air Curtain concept. I like the car! I was expecting more from the engine. But, this would not stop me from buying it. I have to own one, since my license plate is "GOT M". A very small thing...but I think the Engine should have ///M Power or just ///M. Not this upside down "Powered by BMW M". Definetly not a show stopper! 30hp + gain for M model?? What is this? This should be just 135is IMHO. Just look at E89 z4 35i and 35is spec difference. I am almost certain this spec is identical to E89 z4 35is engine. Stupid naming. If this is M, then z4 35is should be called M.
Lol, don't forget the wiper blades. Honestly though it would have been nice to see an integrated CSL-like ducktail for improved high speed downforce, but if they feel that the original lip is sufficient after all that wind tunnel testing, I'm not going to complain. I personally like my carbon fiber one from BMW Performance, shouldn't be hard to just fit it on. Since the hood and trunk lid are the same I don't see it being too difficult fitting carbon items from Vorsteiner, iCarbon, 3D Designs, or Seibon. The 1M is a mixed blessing: Its perfect for someone moving up to an M and loves the 1 series styling/dimensions, but also kind of disappoints those already coming from a 135i (especially those that already modified). I like it though and as I have always stated, if I were buying a car today the 1M would be highly considered and would be a much better starting point than a 135i. The premium between the two is what might deter some people though. SERIOUSLY, no automatic? In SoCal and my wife automatic is a MUST! LOL, I'm all tech-ed out. Overload. Getting Tweet-ed, posting to forums and listening to Bimmercast! Can someone recap the differences between this car and a standard 135 for me? What am I forgetting? This would have such a dream if only it had 360-370 Hp..
South or Scotty26, any chance you can add the UK and Australian pricing to the Spec Sheets? I appreciate the Aus #s are few, I have it on good authority it will be limited to 100 cars here, but having this info now would be great. Maybe it would be to embarrassing for BMW Australia, given it is likely to be AU$110+k or US$108+k (ie we subsidise many countries for their cheap cars). nothing really , 30 HP more than 135 ... almost same body , no M Button , same motor just a bit upgraded , THIS IS NOT AN M MODEL , this should be 135 IS . BMW you failed this time. 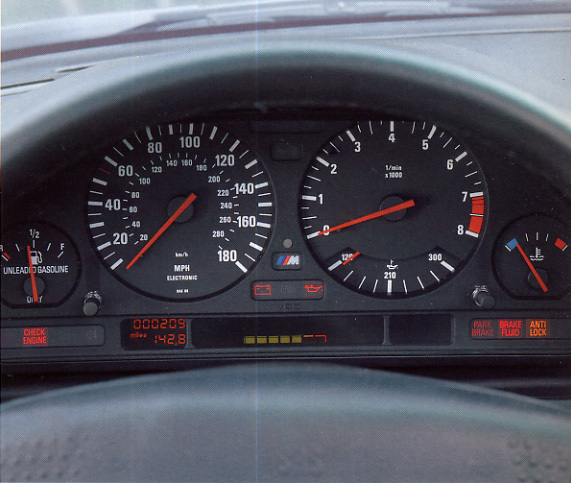 But, it is just me, or do the gauges remind you of the older BMW model gauges? Ill trade my 135 in for it for sure. Its time to sell the car anyway. But seriously I like the body panel changes. I cant wait to see what our Turbo Tuner II and a hundred octane gas does to that extra 30 ponies! Can you say 400 HP easy maybe 420! Single piston calipers? What happened? The M calipers looks quite ugly. I wonder what their reasoning was behind going to a single piston caliper. I suspect cost, perhaps? OK, let's see it in black & white now. Guess Blue isn't going to make the inaugural run. BTW, this thing needs a tune. Is that a 135 airbox and do I see an oil catch can? Last edited by TunedM2C; 12-09-2010 at 07:36 PM.